Need your National Forest Recreation Day Pass right away? Get an ePass! Getting an ePass is easy. Just fill in your information and print it now, or print it later using an order confirmation link you will receive via e-mail. IMPORTANT: Your National Forest Recreation ePass must be printed within 2 days of purchase. After 2 days, the link to the pass expires and you will not be able to print or reprint your pass. No refunds are available for ePasses. If you will not print your ePass within 2 days from the purchase date, wait to place your order. We ask that you plan ahead and visit the U.S. Forest Service web site for more specific information and updates about your destination before placing your ePass order. The National Forest Recreation ePass is honored at all Forest Service recreation day-use sites in Washington and Oregon where "Recreation Pass required" signs are posted. Is a printable pass intended for immediate use. Covers the pass holder and any accompanying passengers at per-vehicle sites. Is valid until midnight of the date printed on the pass. Place on vehicle dashboard so that it is visible and readable. Place multiple passes on the vehicle dashboard if your stay covers consecutive days. The ePass is valid only for the date specified at purchase. The ePass is valid only for the vehicle specified during purchase. Is currently not available for open topped vehicles such as jeeps and motorcycles. Any modifications to the printed ePass will void the ePass. Any attempt to electronically change information on the ePass is strictly prohibited. The National Forest Recreation ePass is non-refundable, non-transferable to another vehicle, and cannot be replaced if lost or stolen. Convenient to purchase and use. Available immediately, eliminating the need to pre-purchase a pass or stop at national forest offices or vendors on the way to your destination. Helps the Forest Service improve and maintain those recreation sites and facilities you visit in Oregon and Washington. Find our more about membership. Most recreation passes are sold as hard-copy only. Please allow enough time to receive them in the mail before you need them. NEW! Need your National Forest Recreation Day Pass right away? 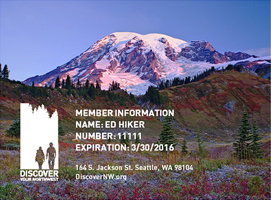 The self-issuing, printable National Forest Recreation ePass is now available. Planning a trip to a northwest national forest, national park, state park, or other public land recreation site? An entrance or day-use fee may be required. Save time and money - get your pass online now!